In some parts of the country, building code requirements mandate 24/7 access to docks from the water, meaning many marinas need ladders that are always available in case someone falls into the water. These requirements are not uniform across the country. While some municipalities and counties require 24/7 access, some insurance liability carriers make it mandatory to have emergency access ladders at the facilities they insure. Even at marinas where a 24/7 access rule is not formally in place, customer safety benefits from emergency access to the docks at all times. 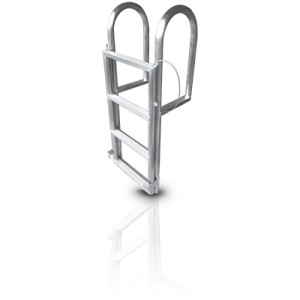 While most dock ladders can address emergency access issues, many traditional ladders also cause problems for marinas. Any wood or metal structure that stays in the water runs the risk of accumulating marine growth, which can harm the function of the ladder or the feet of those that use it. Marinas must spend time and labor to clean barnacles and other marine growth off ladders. To address these safety issues, Atlantic Aluminum & Marine Products (AA&M), based in Lantana, Fla., developed the FloatStep® Ladder, and the design won an Innovation Award at the Marine Aftermarket Accessories Trade Show (MAATS) in 2007 from the National Marine Manufacturers Association (NMMA) and the Boating Writers International (BWI). See the entire reprinted article here.